International resort status. It's superlative golf in summer, and premier ski resort status in North America in winter. Lakes and rivers that range from tame to tumultuous. The spectacular backdrop of the Garibaldi Coast range. Clean mountain air. A wide selection of distinctive shops, restaurants, lounges and nightclubs. It's all here, in Whistler, British Columbia. Here, if you can think of it, chances are you can do it. A breadth of winter activities includes massive snowboarding and skiing on Whistler/Blackcomb with over one vertical mile and 7,000 acres with 33 lifts. Cross country skiing, skating, heli-skiing and backcountry snowmobiling will give you a different perspective. Summer centers on championship golf with designer names like Palmer, Trent Jones, Jr. and Nicklaus. Water sports like lake swimming, whitewater kayaking, canoeing or windsurfing keep you cool. 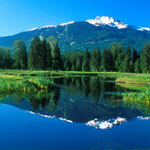 Whistler Mountain offers sightseeing while the valley's mountain biking and hiking is world class. Breathtaking scenic glacier tours, multiple landings and heli-picnics. Flightseeing offers an unforgettable bird's eye view of the Whistler Valley. Charter service is available from several helicopter and floatplane companies. Explore more than 200 shops and boutiques in Whistler Village. Dining in Whistler is a savory fusion experience of worldly cuisines. Two of the best are La Rua Restaurante (604-932-5011), offering continental cuisine, and the Rim Rock Café and Oyster Bar, with its sublime seafood menu and extensive wine list (604-932-5565). On Blackcomb Mountain, Christine's offers West Coast cuisine with elegant linen and silverware service. For savory alpine fare and amazing views of the valley below, call (604) 938-7437 for reservations. Experience the wildlife, vegetation, glaciers and rainforests of Whistler/Blackcomb Mountains on a Mountain Ecology Tour. Learn how conservation helps to sustain health populations. Visit a bear den, or wander in old growth Western Hemlock forests. Check in with Guest Services for further information. For more information on the Whistler Resort, click here. I believe it was a Tuesday. I know it was snowy. The Garibaldi Lift Company flipped a switch and started up the original gondola and Red Chair to transport the first skiers into the expansive terrain of Whistler’s alpine. Right from that very first run, here in Whistler, we knew something was up. In fact, right from the day Alex and Myrtle Phillip, Whistler’s original pioneers, opened the Rainbow Lodge in 1914, something very special was being created. Today, 25 years after that first gondola ride, the resort is home to two towering side-by-side giants, Whistler and Blackcomb. Combined they boast over 7,000 acres of skiable terrain, including: 12 alpine bowls, and 3 glaciers, all accessed by 33 lifts. Some days it’s hard to choose which one to ski or ride. Together they offer the best terrain anywhere in North America, not to mention the little extras like incredible on-mountain food. My personal favorite is the vegetarian chili – my favorite spots are Glacier Creek on Blackcomb or Pika’s on Whistler. And that’s just the winter season …it’s a special place. And a great place to call home. Whistler is a friendly ski town located in British Columbia, Canada and is home to almost 10,000 residents. One of the many things that makes Whistler so special is two unbelievable mountains - Whistler and Blackcomb. Side by side, they represent over 8000 acres of skiable terrain, rising a mile above the valley of Whistler. Whistler and Blackcomb Mountains offer unforgettable skiing, snowboarding, and unlimited winter activities and summer activities. Find something for everyone year round. Located in the Coastal Mountains of BC, Whistler is approximately 115 kilometers (72 miles) from Vancouver. There is little need for a car once in Whistler, so if you are flying into Vancouver, the best way to get here is by bus, limousine or charter plane. If you do decide to drive, book a rental car, grab a map, and head for the mountains. Greatest vertical/usable terrain for skiing/riding and other winter sports in North America. Consistently ranked in the top 5 for North American resorts selected by industry magazines such as SKI, SKIING, Powder, TransWorld Snowboarding and more. Best parks & pipes in North America. Largest above tree line terrain and bowls in North America. Long ski season with skiing and riding into July. Amazing BC après ski and nightlife. World class shopping and dining. Glacier skiing – the only resort in North America where you can ski or ride on a glacier, right in the heart of the British Columbia mountains. And last but not least, we are also known for our friendly, Canadian hospitality! Early settlers to the Whistler valley often heard the Western Hoary Marmot's high-pitched alarm call, echoing in alpine areas. The familiar shrill "whistle" became the namesake of both "Whistler" Valley and the mountain. Actually seeing one of these elusive creatures is a rare and rewarding occurrence. TIP: Ride the Whistler Express Gondola for alpine sightseeing in the summer months and you just might see one of the critters - look down at about Tower #3. Follow Highway 99 North (also called the Sea to Sky Highway) through Vancouver and over the Lions Gate Bridge. Continue north on Highway 99, passing through Britannia Beach and Squamish before arriving in Whistler Resort. The driving time from the airport is approximately 2.5 hours depending on road and traffic conditions. For more information on transportation, such as car rentals, trains, limos, and taxis, please visit www.whistler-blackcomb.com. For up-to-date weather and road conditions for the Sea to Sky Highway. (Hwy. 99 North), please call Mountain FM at 604-932-5090 or visit them at www.mountainfm.com. Additional information on road conditions, weather and snow can be found at www.whistler-blackcomb.com.